Our first complimentary online webinar in 2018 will be presented on January 18 at 12:30pm ET. An announcement for the full 2018 webinar schedule will be made mid-January. The webinar titled “Immigration, Cross Border Tax and Financial Planning Strategies” is targetted for professionals immigrating to the US with the H1-B visa and Human Resources professionals who work with relocated employees. The one-hour free webinar is open to all professionals & individuals. 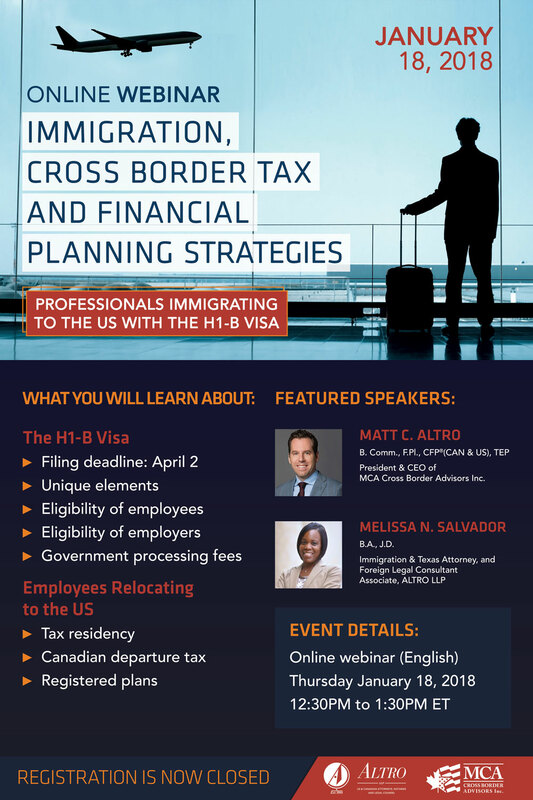 Our featured speakers from ALTRO LLP and MCA Cross Border Advisors Inc. will discuss the many topics listed above, which include H1-B visa facts and processes and information about employees relocating to the US. Spaces are limited and advance registration is required. Click below to register for the webinar. Altro LLP professionals are often invited to be guest speakers at bank and industry events. In addition to these seminars, Altro LLP hosts seminars across Canada during the fall. In past years, we hosted seminars in Toronto, Oakville, Kitchener/Waterloo, Ottawa, Montreal, Pointe-Claire, Calgary and Vancouver. The cities we visit each fall vary, but we also offer a webinar option for those who cannot attend a live seminar presentation. If you are interested in having our team present at one of your events or to your team of professionals, please contact us by emailing our Marketing Manager. To ensure you have all the information about upcoming seminars and webinars you can also signup to receive our newsletter, which includes information about upcoming seminar presentations. Yes, I would like to receive The Altro Group’s newsletters which include updates on the Firms, cross border news & blogs and information on upcoming seminars.